Esoteric Ltd, a leading counterespionage and electronic sweeping company, has achieved another gold industry award from the National Security Inspectorate (NSI) – this time for its 24/7 countermeasures service for the detection of electronic eavesdropping devices, “E-Room”. E-Room incorporates a real-time monitoring sensor, permanently installed into any room where confidential conversations are to take place. The sensor monitors the frequencies in the room and alerts users if frequencies change, indicating that a threat may exist from an electronic device such as a GSM bug, a mobile phone, 3G, Bluetooth and more. The detection is instantaneous and alarms can be audible, graphic or sent using email or SMS messaging. E-Room is unique in that it offers users a fully networkable system with secure remote access for worldwide access and protection. Gold status is only awarded to companies whose services consistently meet the industry’s highest standards through ISO9001 Quality Management as well as the relevant British and European Standards. By meeting the NSI Gold standard, Esoteric can demonstrate that the business is run in a competent professional manner operating to the highest standards and is committed to quality assurance. 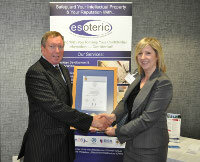 NSI Chief Executive, Jeff Little OBE, visited Esoteric at the CSARN UK Cyber Security Conference in London last month to present the certificate of approval to Esoteric Marketing Manager, Audrey Pilmore-Bedford.